AAA Travel provides peace of mind when you travel -- before, during, and after your vacation! 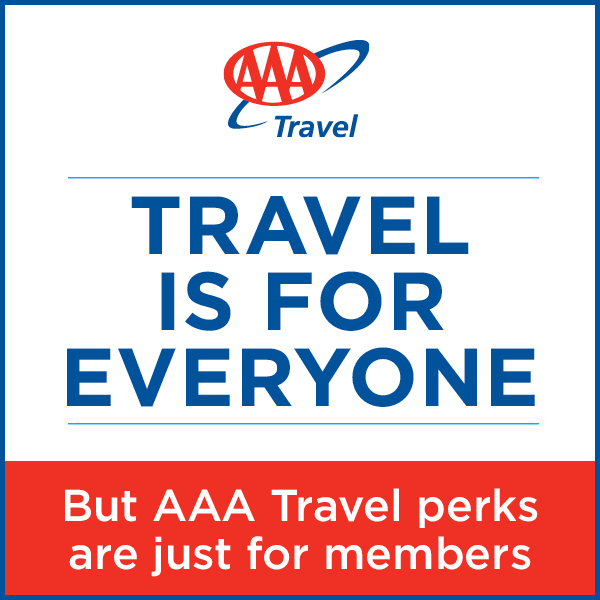 Plus, AAA members enjoy the advantages of membership. AAA Vacations® tour and cruise vacations include 24/7 Member Care and a Best Price Guarantee. AMTRAK VACATIONS - Receive $50 per booking savings off of select packages. ATI - AAA/CAA EXCLUSIVE GETAWAYS - Receive up to $50 per booking rebate. AVANTI DESTINATIONS - Receive $50 per person savings on select packages. BRENDAN VACATIONS - Receive up to $75 per person savings and $40 per person voucher on guided tours. CLUB ADVENTURES - Receive competitive pricing and complimentary excursions. CONTIKI - Receive $50, $75 and $100 optional excursion vouchers on select bookings. INSIGHT VACATIONS - Receive $40 per person voucher for optional experiences on motor coach trips. LUXURY GOLD - Receive $150 Visa Gift card on AAA Vacations Luxury Gold Itineraries. MICATO SAFARIS - Receive $150 per person gift credit to Micato's Online Safari Shop. PLEASANT HOLIDAYS & JOURNESE - receive $25 per booking and $50 per booking activity voucher on select experiences. ROCKY MOUNTAINEER - Receive $100 CAD pnboard merchandise credit on select voyages. TAUCK - Receive $75 per person savings on Domestic Flights. TRAFALGAR - Receive $40 per person credit voucher toward select excursions and tours. BEDSONLINE / TRAVELBOUND - Receive $50 or $100 per person savings on select packages. TRAVEL IMPRESSIONS - Receive $50 per booking credit for select destinations. UNIVERSAL ORLANDO RESORTS - Receive $25 activity credit and up to $150 in savings and preferred seating at select park shows. AMA WATERWAYS - Up to $600 per stateroom savings and up to $300 per stateroom onboard spending credit. AZAMARA CLUBE CRUISES - Receive up t0 $200 onboard spending credit on select staterooms. CARNIVAL CRUISE LINE - Up to $200 per stateroom onboard spending credit. CELEBRITY CRUISES - Receive on board galley tour, up to $75 per stateroom on board credit, and Priority check-in on day of embarkation. CUNARD LINE - Receive up to $300 or $800 per stateroom onboard spending credit, Enhanced Tea service or COmplimentary dinner in Alternative restaurants. HOLLAND AMERICA LINE - Up to $50 per person beverage card for two guests and Dinner for two at Pinnacle Grill or Canaletto. OCEANIA CRUISES - Receive up to $200 per stateroom onboard spending credit, wine tasting, or pre-paid gratuities for first two guests in stateroom. PRINCESS CRUISES - Receive reduced deposit and complimentary 6 x 8 photo per stateroom, Priority check-in, up to $100 onboard spending credit, and Dinner for two in a specialty restaurant. REGENT SEVEN SEAS CRUISES - Receive up to $500 per suite onboard spending credit plus invitation to specialized cocktail party. SEABOURN CRUISE LINE - Receive $300 per suite onboard spending credit for select departures. VIKING RIVER CRUISES - Up to $250 per stateroom onboard spending credit valid for onboard purchases, bar, boutique and excursions. U by UNIWORLD - Receive $100 per stateroom onboard spending credit. UNIWORLD BOUTIQUE RIVER CRUISE COLLECTION - Receive up to $500 per stateroom savings and choice of one-night pre-cruise hotel or $300 per stateroom onboard spending credit.